Everyone knows the Galapagos are a phenomenal destination for wildlife. You can walk alongside giant Galapagos tortoises lumbering around in the highlands, blue-footed boobies doing their mating dance, marine & land iguanas soaking in the sun, and more. Then, jump into the water to snorkel or swim with an array of colorful fish, sea turtles, sea lions, penguins, rays and even (friendly) sharks. It truly is a destination unlike anywhere else in the world. The wildlife is abundant and has little to no fear of humans. 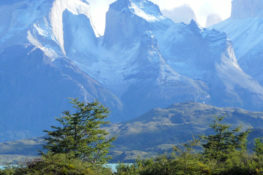 However, what often gets overlooked is that the Galapagos can also be a wonderful trip for culture, history and hiking. That’s what I love about our Galapagos Land-Based Active Adventure Trip. Not only will you get incredible, close-up encounters with the wildlife, but you’ll have time to truly connect with and learn from the people of the Galapagos Islands as well. Explore Floreana alongside Claudio Cruz, the son of one of the islands’ first inhabitants, who grew up on Floreana and can tell you all about the islands’ mysterious history. Walk through the highlands with him and the tortoises while he tells you the tale of and shows where the first inhabitants lived, and describes what life is like on the island now. Floreana is just the beginning of this adventure. You’ll also bike through a mangrove forest filled with iguanas to the historical ‘Wall of Tears,’ hike up a volcano, stand up paddle board or kayak along the shore, stroll down white sand beaches, snorkel in the turquoise blue waters, and much more. And the wildlife will be with you every step of the way as well. Finally, end your day of adventure with amazing stargazing from your rustic front porch on Floreana, a beautiful sunset from your beachfront Isabela property or with a drink at Magic Galapagos’ unique ‘Lava Lounge,’ located in an old lava tunnel. 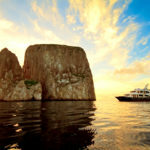 Read on to discover more about this unique Galapagos itinerary or read here to compare a land-based Galapagos trip to a cruise to discover the best fit for you, and then don’t hesitate to reach out to me at 612-315-2894 ext. 105 or Travel@KnowmadAdventures.com to plan your own one-week trip to the Galapagos Islands. A land-based and multi-sport adventure taking you to three different Galapagos Islands. Explore Floreana, Isabela and Santa Cruz on a fun, active and private itinerary. 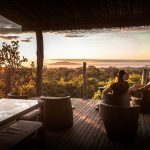 On this Galapagos land-based active adventure, enjoy staying at the Lava Lodge, Floreana’s only lodge, as well as two beach-front hotels. Travel through the Galapagos Islands without going on a cruise and enjoy a private, flexible itinerary. Snorkel amongst playful sea lions, sea turtles, Galapagos penguins and more. Experience a wide variety of activities in the Galapagos, from kayaking and stand up paddle boarding to snorkeling, hiking and more. See the diversity of Galapagos animal life including: Blue-footed boobies, Galapagos tortoises, white-tipped sharks, flamingos, giant iguanas, penguins, sea lions, sea turtles and much more. Learn about the Galapagos Islands’ history, culture and unique folklore with one of the Islands’ best guides. Stay on three different islands in the Galapagos, including two nights at the only accommodations on Floreana Island (this allows you to get off the beaten path and truly experience the area). Upon arrival in the Galapagos you will transfer to Santa Cruz Island. On Santa Cruz Island you will visit two enormous collapsed lava chambers and get your first look at the Galapagos giant tortoise. Enjoy lunch on your way to the town of Puerto Ayora and catch your boat to Floreana Island. Later you will have the opportunity to walk to La Loberia where you can snorkel possibly amongst sea turtles, sea lions, rays and a variety of colorful fish. Take a traditional chiva (small, open-air bus) before hiking around Allieri Hill where you will enjoy a breathtaking view of various landscapes, diverse plant species, pirate caves and possibly more giant tortoises. Learn about this island’s rich history, culture and folklore. After a special lunch, head back to the lodge for snorkeling, kayaking, and stand up paddle boarding. Take a boat to Isabela Island and venture to the Tintoreras, a group of small islands where you can see almost all of the iconic Galapagos wildlife including white tipped sharks, sea lions, turtles, rays, penguins and blue-footed boobies. Snorkel in the bay, and if you’re lucky, a few penguins or sea lions may jump in to play alongside you in the water. After lunch you can walk to a giant tortoise breeding center and learn about how this center is helping the tortoise population recover. Today a morning hike up the slopes of Volcan Sierra Negra (1,300 ft) will take you to the rim of the second largest crater in the world, which spans four miles across. You may then hike the path along the rim and on to Volcan Chico. In the afternoon, enjoy a picnic lunch with spectacular views over the central and northern parts of Isabela Island. After your day of hiking, head back down and relax on the beaches of Puerto Villamil. Today you can kayak to Island Bay, looking for turtles, rays, penguins, blue-footed boobies and sea lions along the way. Watch the wildlife in the bay, and then paddle back to the dock. After lunch bike the Wetlands Trail, passing by marine iguana colonies and mangrove trees. At the end of the trail, you will have the chance to learn about the Wall of Tears, built by Second World War prisoners. Before heading back to town, stop at a local swimming hole for a refreshing dip. End the day with time to swim, snorkel or just relax. Catch your boat to Santa Cruz Island. Enjoy a hearty breakfast before heading up to the highlands for a scenic bike ride past farms, ocean views and then to off-the-beaten-path Garrapatero Beach. Kayak in the bay looking for sharks, rays, turtles and sea birds. After a special lunch head back to Puerto Ayora for shopping or to walk to Tortuga Bay, a large and beautiful beach. At night relax at your hotel or explore Puerto Ayora’s friendly local bars, shops, restaurants or stroll along the beach. After a morning visit to the Charles Darwin Research Center, fly back to mainland Ecuador and continue onward. 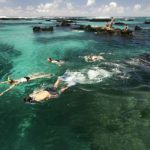 For those who want to travel the Galapagos but prefer less time aboard a ship, want a more flexible and private itinerary or a wide variety of activities, this is the trip for you. With a flexible itinerary and a variety of activities, this Galapagos tour is perfect for active families and couples – adventure by day and relaxation in intimate settings by night. Additionally, Galapagos airfare is estimated at $550 to $600. Knowmad Adventures will book and issue these tickets for you. Single supplement from $475– rates quoted are per person, based on sharing double accommodations. If you request single accommodations you are required to pay the single supplement. Ready to start planning your trip custom and private trip to the Galapagos Islands? The first step is to reach out to one of our Trip Specialists at 612-315-2894 or travel@knowmadadventures.com. For additional details about accommodations, weather and when to go and more, visit the full Galapagos Land-Based Active Adventure Trip page.